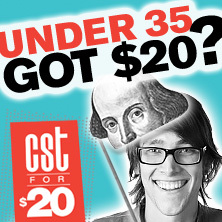 DREW SHIRLEY CHICAGO SHAKESPEARE: Short Shakespeare! productions of A Midsummer Night’s Dream and Twelfth Night, The Heir Apparent. CHICAGO: The New Sincerity (Theater Wit); Born Yesterday (Remy Bumppo Theatre Company); Troll (Fraud & Phony Theatricals); productions with Erasing the Distance, One Year Chekhov. REGIONAL: The Comedy of Errors, Much Ado About Nothing (Door Shakespeare); Peter and the Starcatcher, Cyrano de Bergerac (Utah Shakespeare Festival); Much Ado About Nothing (Shakespeare by the Sea); A Midsummer Night’s Dream (Kingsmen Shakespeare Company); The Taming of the Shrew (Hermosa Beach Playhouse). EDUCATION: MFA in acting, University of Illinois; BFA in theater, Emporia State University.